VW Group CEO Martin Winterkorn says a decision to expand the automaker's new Tennessee factory will be determined by how quickly the VW brand rebounds. 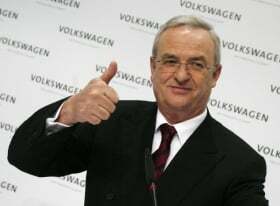 CHATTANOOGA, Tennessee -- Volkswagen Group CEO Martin Winterkorn said VW will decide in the next 12 months whether to expand its new U.S. factory here to build a second VW model and whether to make a vehicle for the Audi brand. Winterkorn said a Porsche model would not be built in the United States. He was speaking on the sidelines of ceremony marking the opening of VW's new U.S. plant here on Tuesday. The VW chief said he is optimistic about the automaker's future in the United States and its ability to meet an annual sales target of 1 million units for VW and Audi by 2018. The decision to expand the Tennessee factory will be based on how quickly the VW brand rebounds, he said. "We are launching three new [VW] cars and I am sure they will be a success but we should wait and see," Winterkorn said. The vehicles include the redesigned 2011 Jetta made in Mexico and launched last year, the redesigned 2012 Passat being built at the new Tennessee factory and the redesigned 2012 Beetle that is built in Mexico and goes on sale this autumn. Through April, the VW brand's U.S. sales are up 17 percent from the same period a year ago to 95,581 units. In 2010, the VW brand's U.S. sales hit 256,830, up 20 percent. Winterkorn said VW's commitment to the United States is underscored by the $1 billion Tennessee factory and the $2 billion is has spent developing the latest Jetta, Passat and Beetle. Winterkorn said he and top VW management drove the Passat on Monday from New York City to suburban New Jersey. Afterward, he gave the car its final approval. Frank Fischer, head of Volkswagen's Chattanooga operations, said the factory has produced about 1,600 Passats to date for testing and for customer sales. The Passat designed for the U.S. market will have a base price of $20,765, including shipping. That is about $7,000 less than the smaller, more premium German-built Passat that is sold in Europe. Fischer, pointing out highlights of the factory, said it is "striving for the highest U.S. Leadership in Energy and Environmental Design standard certification we can achieve." The designation is based on sustainable and environmentally compatible construction of buildings. The factory uses 35 percent less energy than a "standard industrial building," Fischer said. The walls are aluminum and insulated with six inchesof mineral wool. The roof is covered in a white membrane that reflects heat and keeps the plant cooler in summer. Rainwater is collected from the roof for factory use, including cooling the welding guns. The paint shop uses a scrubber system that produces no liquid paint sludge. The paint overspray is collected and residue is later turned into concrete. The process also saves 50,000 gallonsof water a day. The plant is the only VW factory to exclusively use energy-saving light-emitting diode systems for outdoor lighting. The lighting system uses 20 percent less energy than a comparable facility. The new factory will produce up to 150,000 vehicles a year with 2,000 employees. Winterkorn said the local content of the Passat being made at the plant is 80 percentbased on the value of its parts.